Students entering Holland College’s Automotive Technology and Business programs have access to two new entrance awards, thanks to a financial boost from the PEI Automobile Dealers Association (PEIADA). The PEIADA has a long history of support for Holland College through the Holland College Foundation, dating back to 1992. In 2017, the association topped up their existing fund with a new $37,000 gift, designated for student financial aid. Darren Noonan, President of the PEIADA, highlighted the desire of those in the auto industry to encourage students to consider meaningful careers in management and administration, sales, service and parts in the automotive industry in Prince Edward Island. Natalie Mitton, Director of Programs at Holland College, lauded the benefit that investments made by industry have on the college’s students and programs. The awards are available to students who are pursuing careers in the automotive industry in PEI. Recipients must be PEI residents who are accepted into Holland College’s Automotive Technology program, or into one of Holland College’s Business programs (Accounting Technology, Administrative Assistant, Business Administration, Human Resources Management, and Advertising Management). In all, five awards valued at $1,000 each are available annually. For complete details, visit scholarships and awards at hollandcollege.com. The PEIADA is the provincial voice of automobile dealers’ province-wide, representing their collective views, opinions, and needs, while serving as an advocate to government, industry, and the media. Visit peiada.comto learn more. 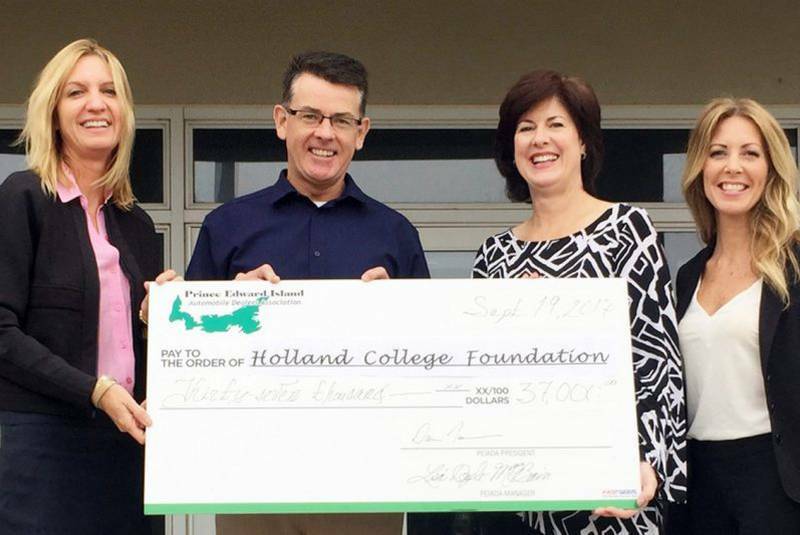 In this picture: Natalie Mitton (L), Director of Programs at Holland College, and Jo-Ann Campbell-Boutilier (R), Executive Director of the Holland College Foundation, accept a cheque from PEIADA President, Darren Noonan, and Lisa Doyle-MacBain, Manager, Provincial Association Executive PEIADA.